Since this Mashed Potato Candy recipe is an unique and unusual recipe, I thought everyone would enjoy seeing it and perhaps making them. This is also a great recipe to use up extra mashed potatoes. No one will guess that you have used mashed potatoes in this recipe, unless you tell them! Mashed Potato Candy is an old family recipe that has been passed down for generations. Also learn how to make Mashed Potato Fudge – This candy taste kind of like Almond Joy (Mounds Bar) candy bars, but without the almonds. It is difficult to find written documentation or early cookbooks on the history of potato candy. Most people that remember this candy as a child recall the recipe being passed down from Grandparents and Great Grandparents of German or Irish descent. Many believe the recipe to be introduced by the Pennsylvania Dutch. A common frugal German practice was to find delicious food uses for leftover potatoes. The most popular recipe version is a rolled candy with a sweet filling in the center where other versions cut the candy into small squares or rolled them into balls. Different fillings that were used range from chopped nuts, candied cherries, coconut or chocolate. Sometimes coloring is added to the potato dough for festive holiday colors. Source: Reader comment added to page of Ethnic Scrapbooking – What’s the Potato Candy’s Ethnic Origin. 1 baked potato Confectioners’ sugar Vanilla Melted chocolate. As soon as the potato is baked, warm a mixing bowl and scoop the potato from its skin. Mash and add confectioners’ sugar, stirring and adding until mixture can be kneaded with the hands. Knead well, keeping warm, add vanilla and form into small balls. Dip quickly into melted chocolate kept warm over hot water and drop on waxed paper. Or shape like Easter eggs and dip. Potato balls can be flattened and topped with English walnut halves, the mixture can be used to stuff dates, which are then rolled in sugar, or it can be rolled out like dough, spread with peanut butter, rolled up and sliced, then dipped in coconut. * Learn how to make Perfect Mashed Potatoes. 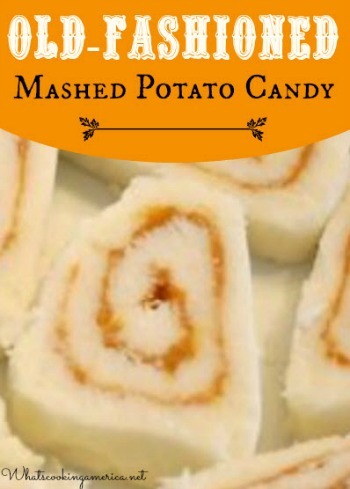 You can also use instant mashed potatoes to make this candy. ** Potatoes are different sizes. If you end up with more potato, you will need more confectioner's sugar. While the potato is still warm, scoop out the contents of the potato and mash well. Mix in vanilla extract, maple flavoring, or almond extract, and powdered sugar into the mashed potato mixture until you have a stiff, workable dough. As the remaining sugar is added, the mixture will become very stiff and difficult to stir. Refrigerate for at least 1 hour to stiffen the dough. Place a large sheet of parchment paper or an Silpad on a large cutting board. Sprinkle powdered (confectioners' sugar) on the board. Using a rolling pin, roll the chilled dough into a large rectangular shape, approximately 1/4-inch thick. Add additional powdered sugar if dough gets too soft. Spread the top of the dough with the creamy peanut butter. Roll up the dough into a jelly roll shape (just like making a cinnamon roll). Roll up in plastic wrap and refrigerate for 3 to 4 hours. To serve, slice the chilled rolls into approximately 1/2-inch pieces. Store candy in the refrigerator; bring to room temperature to serve. Keep candy pieces covered as they will dry out quickly.